Disneyland Paris (formerly Euro Disney). The largest section at the top left is Disneyland Park below which is the smaller Walt Disney Studios Park and the east are the hotels and a massive car park. I tried to find some Mickey Ears for the thumbnail shot but there doesn’t appear to be any 🙁 Can any of you eagle eyed sightseers spot a mouse? There is supposed to be a water tower there called “The Earful Tower”. Secondly, allow me to apologize on behalf of America for that stupid f**king name. The Earfell tower is outside the Studios Park. You can see it being constructed here. It’s not large enough to see from the satellite photo though. I don’t think it was intentional due to the size, but if you zoom out a bit, the circular road around the whole area combined with the vaguely circular housing developments to the south and east do give a pretty good impression of the Mickey logo. i live over in belgium and go down to paris on occasion for pin trading in the park. 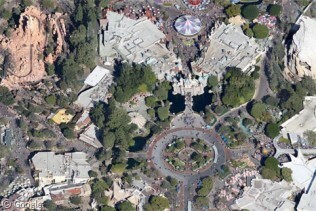 the aerial photo here is to far up to see the mouse ears at the main entrance to the park in the flowers. its that square patch in the middle of the pathways going to the ticket area. also i think there is a mouse ears water tower over in warner bros park. otherwise its mouse ears here and there in the hedges around the park. Hehe, seeing as I have been to Disneyland lots of times, I can tell you that the mickey mouse face is right here: View Placemark. It’s very small and hard to see though. 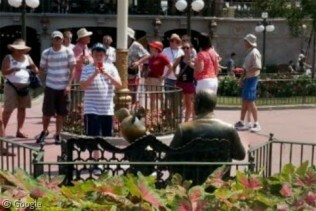 See the railroad station? It’s in about the center of the image. Well start by looking at the center of it them look a tad more southeast until you see that tannish-circle.